I've had arguments with people who refuse to believe that the following is true. But regardless of what your eyes are telling you, it is. If you don't believe me, load the image up into an image editor and query the pixel values (or hold a piece of paper with two small holes up to your monitor). 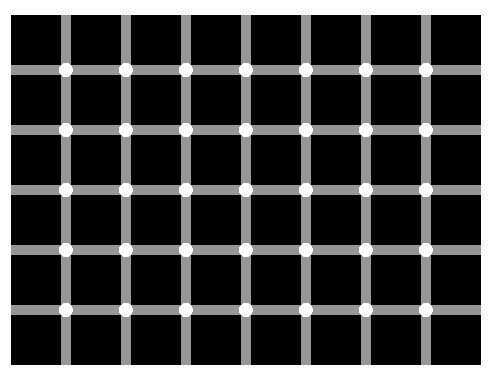 Try counting the black dots in this one. Follow the instructions at the base of this image. 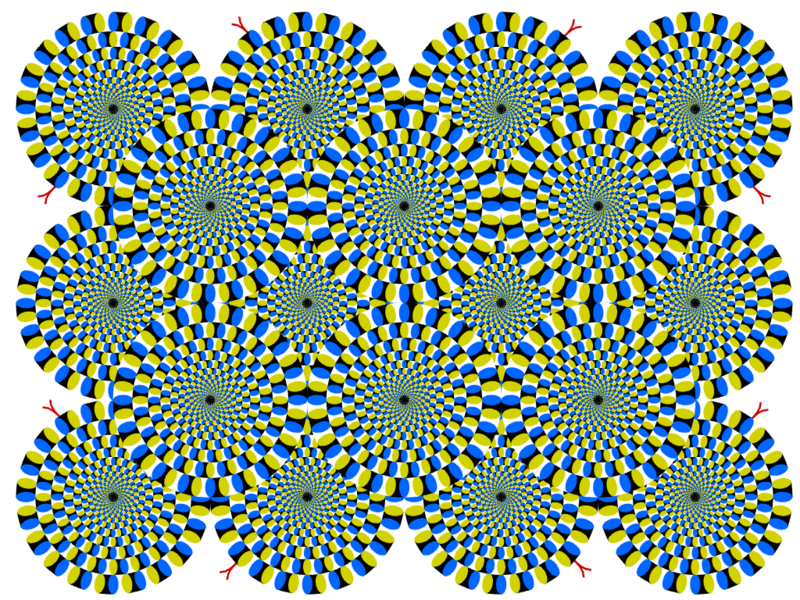 This one is from "Akiyoshi's illusion pages". It's hard to believe these are all straight lines! This one is frustrating to look at. I got it from "http://tosh.cc.com/blog/files/2009/08/circles.jpg". 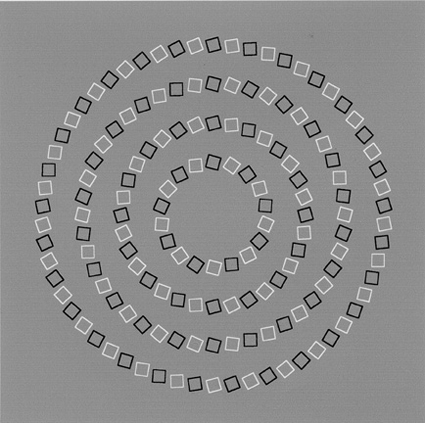 It's actually four perfectly round concentric circles, but it certainly doesn't look it! This one is also from "Akiyoshi's illusion pages". The green and the blue in this image are actually the same color. This one is also from "Akiyoshi's illusion pages". What makes the eyes do this? This one is probably my favorite. It's also from "Akiyoshi's illusion pages". It's hard to belive this is a still image! Here's another one of a similar theme. I'm unsure of it's original source, but I got it from "http://i.imgur.com/0bXCJ.jpg". It's a bit too bulky to show inline, so you'll have to click on the link to see it. It's best viewed fullscreen. 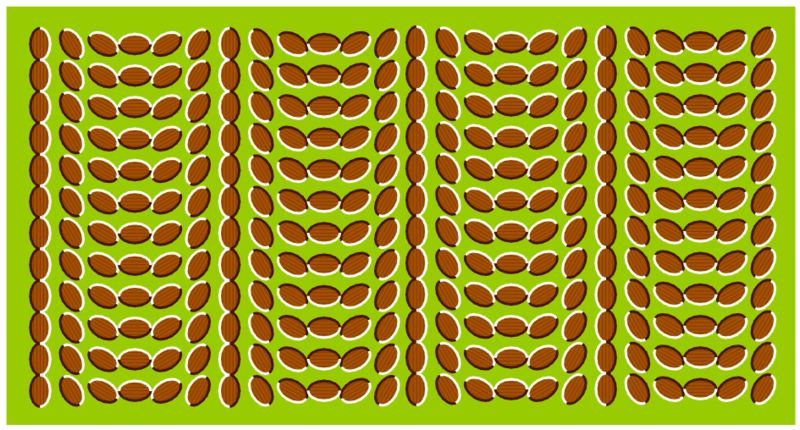 This one actually is an animated image. 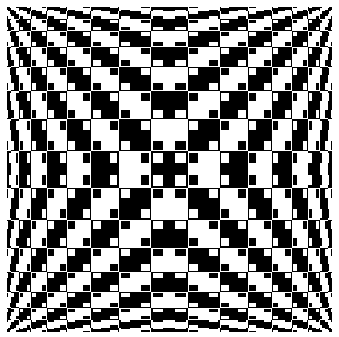 It was the picture of the day on Wikipedia on 2007-06-14, and is called the lilac chaser optical illusion, also known as the Pac-Man illusion. 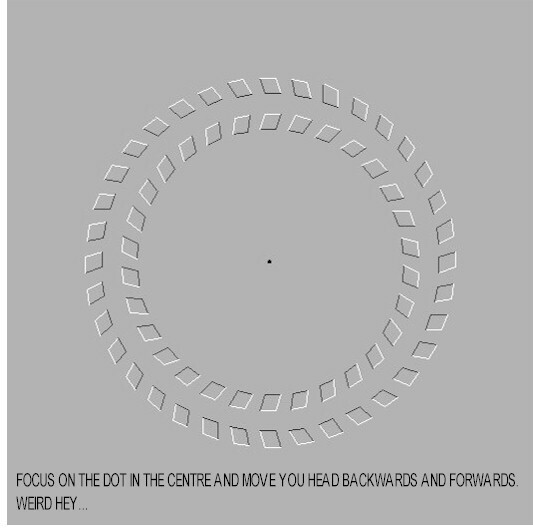 As Wikipedia stated: "When one stares at the cross in the center of the image for 10-20 seconds, two effects will appear in order: One, the moving empty space between dots will appear as a green dot. Two, the moving green dot will appear to wipe out the purple dots, until only the green dot is visible. 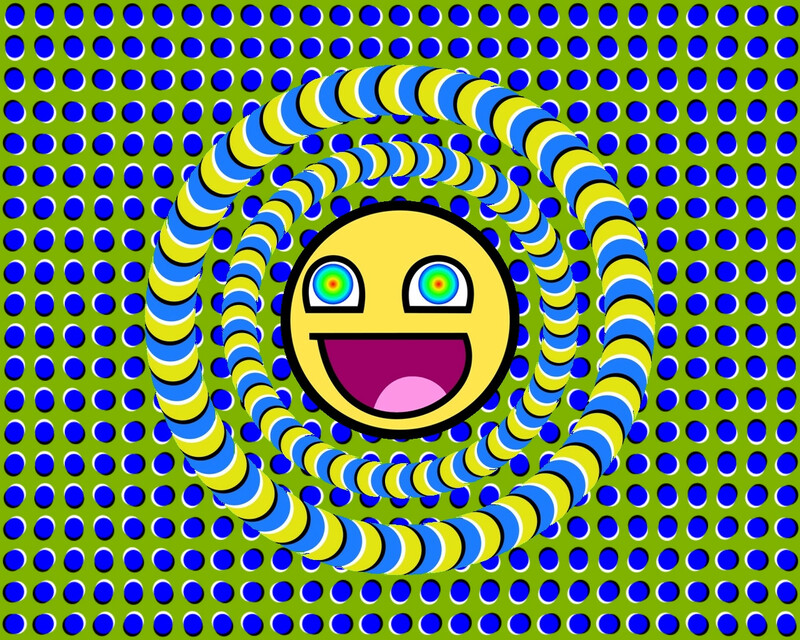 A separate effect appears if the eyes move away from the center, showing a ring of green dots." Here's another animated image. Again, I'm unsure of it's original source, but I got it from "http://www.sadanduseless.com/animation.php?n=763". First just watch the faces so you can see that they're all normal celebrity photos. Then watch it again, but this time keeping your eyes on the cross in the middle. Freaky. 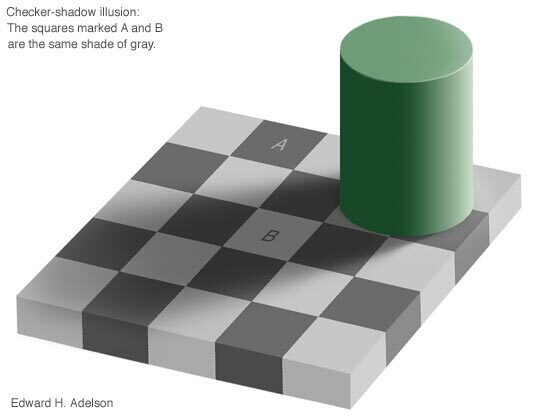 The following page contains a fun set of links about optical illusions. Thanks to Willow for sharing this.